You will need very small amounts of coloured yarn. I have used Stylecraft Special Dk. You can use as many colours as you like but I recommend no more than 6 or 7 while you practise the technique. You will also need a 4.0mm hook but it is not crictical and one stitch holder for each colour . Finally you will need a ring to hang it all in. The ones I have used are about 25 cm in diameter but again it is not critical and the pattern will explain how to adjust the size of the crochet to fit the ring. You can buy dream catcher rings from ebay or you can use embroidery hoops but I have also removed the rings from old lamp shades because I love recycling. You don't need to read the red bits unless you want to add more colours or adjust the size. 1. 7ch. Join into a ring with a ss. This is suitable for 7 colours. TIP: If you can do a magic circle instead of the 7 ch it is much easier to add more colours to the pattern. If not then you should increase the length of the starting chain by 1ch for every 2 colours you add. 2. 2ch, 1tr into the ring, 1ch insert stitch holder. 3. Join the next colour to the ring and repeat 2 above. 4. Repeat until you have used up all your colours. TIP: The piece looks like a unicorn nest by now and it is a really good idea to run in the short ends at this point. If you haven't done so already. 5. Pick a colour, remove the stitch marker and make 2tr, in the gap between the 2ch and the tr of the next colour then 1ch before inserting the stitch marker..So above the dark yarn has been crocheted into the red, the red in the orange etc. Repeat this with each colour until you get back to where you started. 6. The next round is crocheted into the 1ch space just after the first treble. The hook in the picture above is showing where the orange yarn will make the next pair of trebles. So as before pick a colour, 2tr in the 1ch space of the next colour and then 1ch. Repeat for each colour. 7. Pick a colour 2tr in the next 1ch space of the following colour then 2ch, repeat all round. 8. 2tr in each 2ch space, and then 2ch. all round changing colours as before. TIP:You may find that your crochet spiral is becoming a bit dome shaped but it does not matter as you will be stretching it onto the hoop later. 10. This time work 3 trebles into the 2ch space of the following colour then 3ch, repeat all round. 11. 3tr in the 3ch space of the following colour, 3ch repeat all round. 12. 4tr in the 3ch space of the following colour , 3ch repeat all round. 14. 5tr in three ch space of the following colour 2ch repeat all round. Do not cut the yarn. Notice that the spiral is quite a bit smaller than the ring. this is because you are going to stretch the spiral onto the ring. There are two ways of increasing so that the circle becomes bigger as you go. Either increase the number of chains between the trebles or increase the number of trebles in each group. If your trebles start to lean back it is time to increase. It does not matter how you choose to increase as long as you use the same method all the way round. 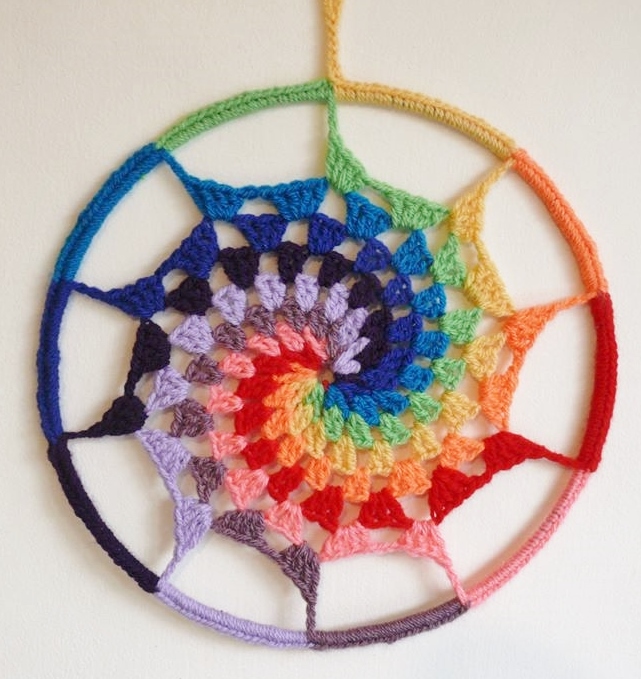 Next time how to join the crochet to the hoop.